Wrap each heart of palm with a strip of bacon. 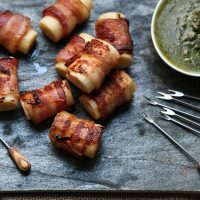 On a parchment-lined baking sheet, arrange the bacon-wrapped palm tubes seam-side down so they don’t unravel. Bake until the bacon is browned on the bottom, about 20 minutes. Remove the pan from the oven and rotate the hearts of palm. Return to the oven for another 10 minutes, until the fat is completely rendered and the bacon is crispy. Serve warm alongside the pesto for dipping.